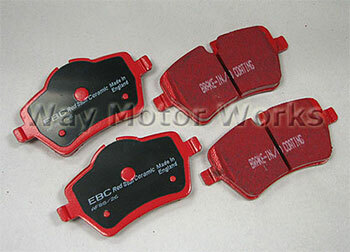 EBC Redstuff Brake pads for 07+ Cooper S R56 and R55 Clubman S, R58 Coupe S or R57 Cabrio S and R59 Roadster S.
These pads dust less than factory pads, but the dust can be a bit harder to wash off in my experience. They are not as "grabby" as the factory pads which I really like. They can be a bit hard on the factory rotors, but I've also used them with the Freemax rotors and they seem to wear better. I'm very happy with these pads - they have a very linear feel and I have not been able to fade them yet with street driving. Just installed these on my 07 Cooper S along with the Zimmerman cross drilled rotors. What a difference in braking. I'm still bedding them in but so far I'm really impressed with them. If they dust out half as much as the stock pads do I'll be happy enough but I can tell you the brake feel is so much better then the stock. It's probably the combination betwenn the new rotors and the pads. This is a good conservative upgrade to the stock items. Thanks again Way. By the way, I don't race but do like to run a little spirited on the streets once in awhile (where it's safe of course). I seriously love these brake pads. Way installed them for me when my stock pads needed to be replaced. I was completely sold on them after taking a 1,500+ mile trip over the course of a week and had virtually NO brake dust on the web spoke wheels of my '08 Clubman. I've now had them for over 10k miles and am very pleased with their performance. A good value, too! Another happy customer! These pads were on RED 5 for about two months before i started to see traces of brake dust. They have performed well, and look really good when we're washed up.